A cozy fire on a cold night is a delight. But it loses its charm when you must wait for it to burn out before heading to bed. A wood fire left untended isn't safe. Unlike a gas fireplace, which can be switched off, the only way to leave a wood fire is to close it off with glass doors. Most new fireplaces come with glass doors. But if you want to add this safety feature to an existing fireplace, retrofitting them isn't difficult. The doors come in standard sizes that fit in any flat firebox opening. 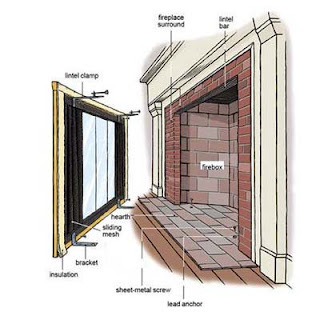 We asked Justin Calemmo, of Five Sons Chimney Service in Brookfield, Connecticut, to show how to retrofit new doors on an old fireplace. Our 1848 fireplace has a surround that's undersized, so the glass doors make it safer by blocking the fire from the too close wood floor and mantel. The fireplace that was at my mother's home years ago didn't have a glass door installed, I knew it was unsafe and she told me how she would keep it lit at night anyway, being good luck for the coming day to keep a fire lit.